AMD Preparing A85FX FM2 Chipset for its Next Generation 'Comal' APU Platform "Trinity"
AMD has started preparing the A85FX-FM2 Chipset for its next generation Trinity APU’s which are part of its “Comal” Platform. 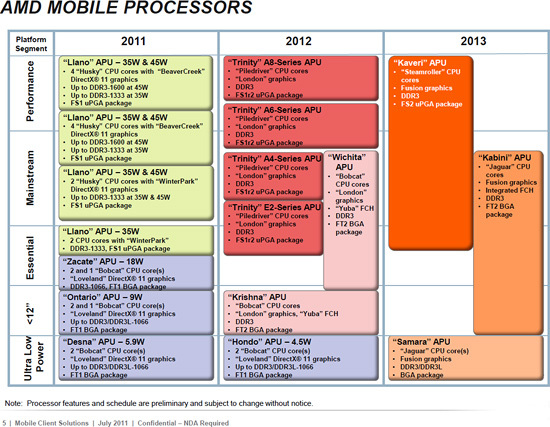 The Comal Platform along with Trinity APU’s are expected to launch in Q1-Q2 2012 and this news suggest that AMD is gearing up for an early 2012 launch of its new APU platform. The Chipset will also allow a boost of upto 50% GPU performance for the built in DX11 IGP’s on Trinity APU’s. Trinity APU’s themselves would feature 4 enhanced Bulldozer based x86 cores, code named ‘Piledriver” and AMD’s next gen “HD-7000” Series chips as rumors suggest. However it has been reported that the new chipset will only support FM2 socket APU’s and will not be compatible with Llano Fusion chips.